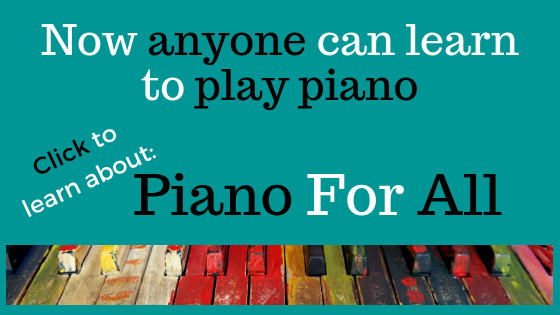 It is a great approach for older teens and adults who’d like to play piano as well. Classical piano really does take a long time to learn and is very focused on getting things right. Chords are based on patterns. These patterns are based on music theory (that you can learn) and once you understand it, you can play any chord you want whenever you want - without looking it up. So you don’t need written music to play chords. You do need to understand chords titles, key signatures and how chords are made up. 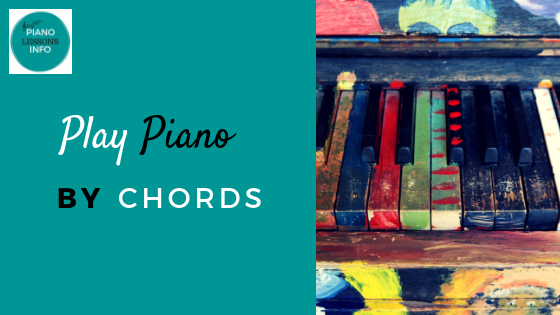 Here is the step-by-step approach you need to take to learn to play piano by chords. If you are a complete beginner, you need to learn the notes of the piano first. Step 1. Learn the notes on the piano keyboard. You can do that on this site by going to the piano key notes page which will explain it all. You can also go to the piano keys video lesson. Step 2. Learn some basic chords. Basic chords basically involve playing 3 notes together and are major and minor chords. Go to the basic piano chords page to learn more about them. From here, you can look up chords to a song like Hallelujah by the Jeff Buckley. If you find the song has simple chords, you can try playing it. 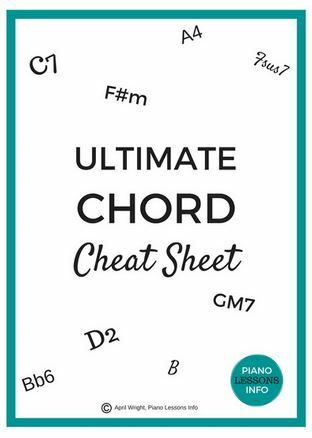 Step 3: Download the free Ultimate Piano Chord Cheat Sheet. This will give you the notes to all chords and is a great resource for looking up chords while you’re learning. Step 4: Keep learning more about chords. Your approach depends a little bit on you and your experience. There is a lot of information about chords on this site to help you. Here's a list in order from beginner stages to more intermediate chord information. Our chord piano lessons page will also take you through some basics and on. What are piano chords? A short summary of what chords are. Understanding piano chords. A short summary of the different elements that make up chords. Basic piano chords. The notes and an explanation of basic chords. Understanding chord titles. An explanation of chord titles and what they mean. How to make chords. The elements of chords and how to put them together. How to play chords. Some tips on the actual piano playing part of chords. How to read piano chords. A more advanced explanation of how chords are made up and their various elements. For reference, you can also check out the chart of piano chords. Learning to play piano online through a systematic approach will ensure you don’t miss learning something that you don’t know about. It is also easier than trying to figure it all out on your own. The cost of learning online is the same as a few lessons with a teacher so this is a great way to save money as well. The piano course I recommend due to its popularity and how quickly it gets you play is Piano For All. Step 6: Practice, practice, practice. The more you practice, the better you’ll get at chords and the easier it will be to keep going and play a wider variety of music. From here on out, it’s all playing! Return from Play Piano by Chords to Piano Lessons Info Homepage.